Houghton Falls is north of the road between Laurium and Lake Linden. 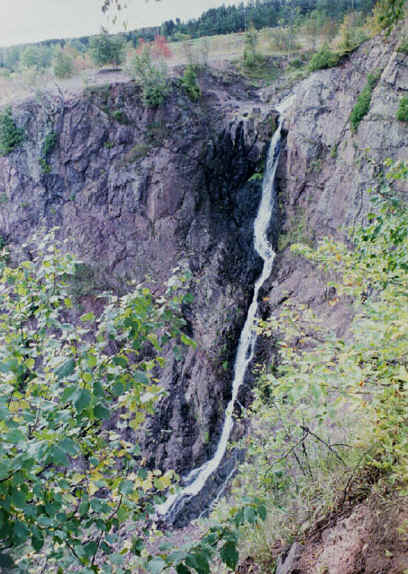 At one time (1981, when this picture was taken), it was possible to park by the side of the road and walk to the top of the falls. We were able to ford the stream and walk along the north edge of the gorge. This picture was taken from the north edge of the gorge. Behind us was a field full of giant sunflowers. I understand that it isn't possible to get here any more, because too many people attempted to climb down to the bottom of the gorge and got into trouble and had to be rescued. It's a shame when a few idiots spoil a lovely spot for the rest of us.